Windows, SQL Server, PDF, Word, Excel, Outlook, FTP, Email, etc. It is considered best practice to configure SQL Server instance to allow only Windows authentication. However, some situations require that SQL Server authentication be used. In this article we'll explain two methods to change SQL Server to mixed mode authentication after installation. 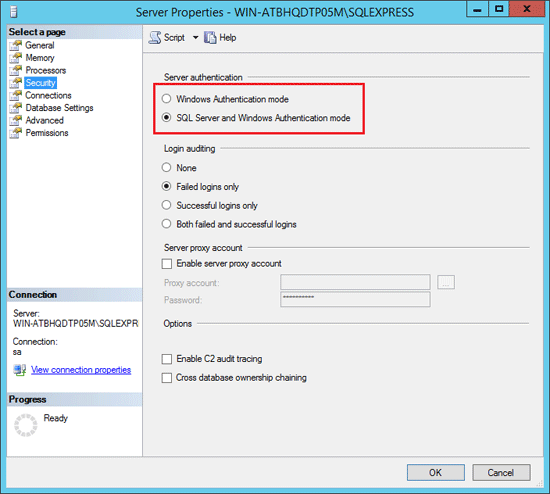 As long as you can connect to SQL Server with Windows authentication, you can enable mixed mode authentication easily using SQL Server Management Studio. 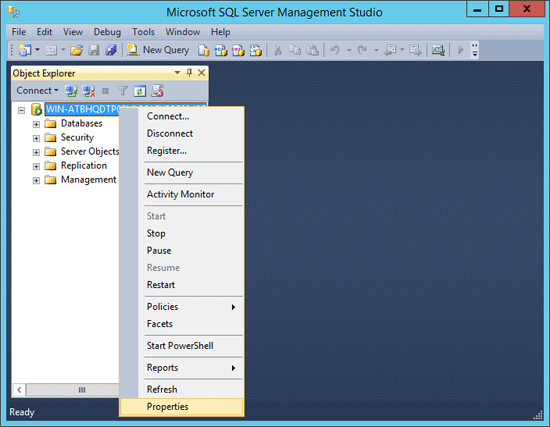 Login into SQL Server with SQL Server Management Studio. In Object Explorer, right-click the name of the server that you wish to reconfigure and select Properties from the menu that appears. This displays the Server Properties dialog box. Select the Security tab and you can then choose SQL Server and Windows Authentication mode (also known as mixed mode authentication). Click OK to save the changes and restart the SQL Server service. If you don't have sufficient privileges to enable the mixed mode or couldn't login with Windows authentication, you can enable mixed mode authentication with a registry fix. Press the Windows key + R to bring up the Run box. Type regedit and press Enter. Navigate to the registry location: HKEY_LOCAL_MACHINE\SOFTWARE\Microsoft\Microsoft SQL Server\MSSQL12.SQLEXPRESS\MSSQLServer, where MSSQL12.SQLEXPRESS is the name of your SQL Server instance. In the right panel, change the LoginMode from 1 to 2. 1 = Windows authentication Only. 2 = Mixed mode. Restart your SQL Server instance and you can then connect to the server by using SQL Server Authentication. If Windows authentication mode is selected during installation, the SA login is disabled and a password is assigned by setup. 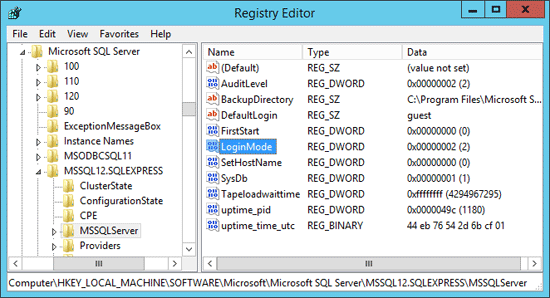 If you later change SQL Server to mixed mode, the SA login remains disabled. With SQL Server Password Changer you can reset lost SA password and unlock SA account easily. Ready to try or buy? About Us|Privacy|Affiliate|Blog|Contact Us|Links|Sitemap Copyright © 2007-2018 Top Password Software, Inc. All Rights Reserved.